Smokey Remembered (7/365 year 3) – Annoyingly Boring? Today over at The Daily Shoot the assignment was pet portraits. I didn’t feel like taking Fluffy’s photo but thought I’d share my most favorite key chain attachment. This was Fluffy’s brother’s tag. After we had to put him down I added it to my key chain so I would always have a reminder handy. Smokey has been gone for years now, but he’s still fondly remembered. Such a sweet boy. 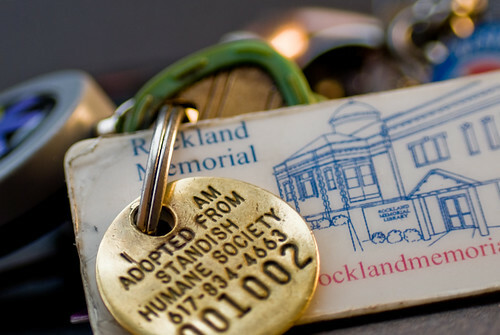 Many times over the last two plus years I have turned the camera towards my keys, but I don’t recall ever actually using them as a daily photo. .-= Ruprecht´s last blog ..#28: Scavenger Hunt Break =-. Oh, that might be the sweetest thing I’ve seen in a long time. I love the story behind the photo. Well done, and an honor to Smokey’s memory. Ah, 617 area code. I used to be 508 (right next door). What a nice idea to put that on a key chain. We saved our dog’s whole collar and put it over the fireplace. .-= Keith Wilcox´s last blog ..Home Alone: What is the Right Age? =-. Aw, PG. What a great shot. And an even greater story to go with it. .-= Maureen´s last blog ..Blog Candy! =-.